Compatibility of functions is a classical topic in Universal Algebra related to the notion of affine completeness. In algebraic logic, it is concerned with the possibility of implicitly defining new connectives. 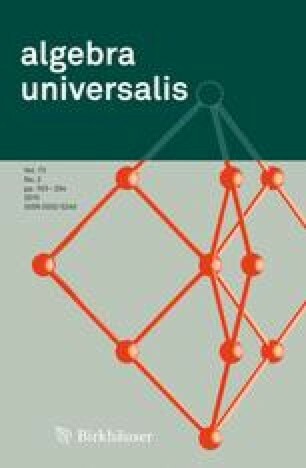 In this paper, we give characterizations of compatible operations in a variety of algebras that properly includes commutative residuated lattices and some generalizations of Heyting algebras. The wider variety considered is obtained by weakening the main characters of residuated lattices (A, ∧, ∨, ·, →, e) but retaining most of their algebraic consequences, and their algebras have a commutative monoidal structure. The order-extension principle a ≤ b if and only if a → b ≥ e is replaced by the condition: if a ≤ b, then a → b ≥ e. The residuation property c ≤ a → b if and only if a · c ≤ b is replaced by the conditions: if c ≤ a → b , then a · c ≤ b, and if a · c ≤ b, then e → c ≤ a → b. Some further algebraic conditions of commutative residuated lattices are required. The author thanks José Luis Castiglioni and Manuela Busaniche for several conversations concerning the matter of this paper. This work was partially supported by CONICET Project PIP 112-201101-00636.